Play Russian Bank (also known as Crapette) card game online with your Computer at www.zankpatience.de! Since Russian Bank (Zankpatience) is a 2 player game, you can play here against the computer. Before you begin to play, each player (you and the computer) has got a standard 52-card pack of cards. Each pack has been shuffled at the beginning of the game. 4 cards of each pack have been placed in a row vertically on the table. There are 2 rows of four cards on the table, called "houses". The space in between is called "foundation piles". 12 cards of each pack has been counted and placed in a pile face down. The 13th card has been placed face up onto it and has been given to your opponent to do the same, giving you 13 cards. If you manage to play all of your cards, so that you have none left, you win and the game is over. * Houses: add the card with alternating colors and descending sequence. For example jack of spades: you can add a ten of diamonds or a ten of hearts. * Reserve and waste pile: You can add card to the opponent's waste or reserve pile. 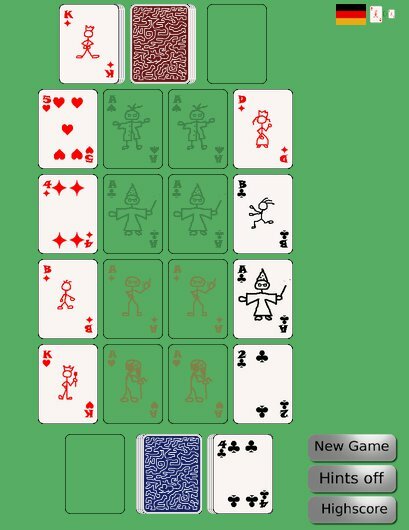 The cards must have the same suite and an descending or ascending number. For example the opponent's tile shows a queen of diamonds, you can add a jack of diamonds or a king of diamonds. At each turn you may play as many cards as you can and wish to, but you must end your turn when you have no legal continuation. At first you take the cards from the reserve pile, when the card does not match, place it on the reserve pile face up. Afterwards take your cards from your pile and add it to the waste pile when there is no match. Now.. have fun playing Russian Bank at www.zankpatience.de!